This post is a continuation of my previous post which dealt with Robotics and Automation. Here you get to know the different components in brief like Locomotion, Actuators, Sensors, Signal Processing, Control System, etc. Well, for long I was in my shelter. Finally I decided to come out of it and write something for the beginners out there. 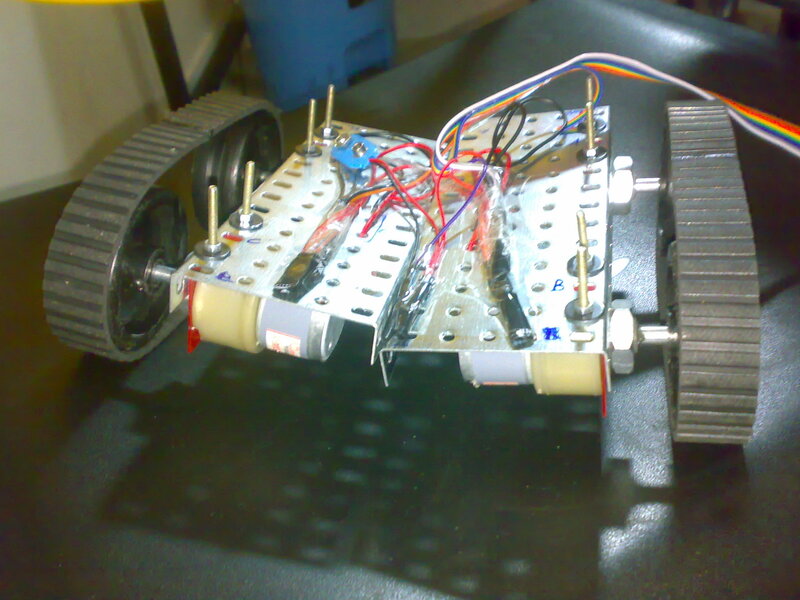 So this article is dedicated to the robotics enthusiasts spread all over the world! So, I guess you all are familiar with robots. If not, then you can read the post in which I have discussed the basics of robotics and automation. Getting straight to the point, for a robot to be mobile (which can move), it should have some basic systems as mentioned below. Locomotion System – This system defines how the robot moves. Whether it’s translatory motion, rotatory motion, etc. Using this system, you can make your robot move forward, backward, right, left, climb up/down, etc. To accomplish this, we need devices which convert electrical energy into mechanical energy. Such devices are called actuators and the most popular actuator is the DC Motor. Power Supply System – For a robot to work, we need a power supply. It acts as food to the robot. Unless you feed your robot, it cannot work! Thus, we need to provide a power supply for that. For robotic applications (in fact most major applications), we need DC supply (usually 5V, 9V, 12V DC, sometimes goes as high as 18V, 24V, 36V, etc. as per your requirement). The best way for this is to use a battery (as it provides DC supply directly) or use an SMPS/Eliminator to convert AC to DC and then use it. But voltage is not the only thing that matters while choosing a proper supply. Your power source should also be able to supply sufficient current to drive all the loads connected to it, directly or indirectly. Actuator System – As described above, actuators are devices which bring about the locomotion of the robot. There are many actuators used like DC Motors, Stepper Motors, Servo Motors, etc. The way they are connected together, their circuit diagram, their location, orientation, position, etc. everything comes under Actuator System. Sensor System – In order for the robot to interact with the physical world, we need to introduce sensors (which can measure physical parameters like temperature, pressure, heat, radio waves, IR waves, etc). These sensor systems provide a feedback from the real world to the digital world (embedded electronics), which are processed and the robot takes the decision accordingly. Signal Processing System – The data from the sensors and other electrical and digital signals need to be processed, so that the robot analyzes the situation and makes its moves. For this, we introduce electronic components to process the signals. The components can be any analog/digital device, or even a microcontroller. Control System – This is the major governing system of the robot. Every system that is present inside the robot and functioning can be represented in form of a control system (open-loop and closed-loop). This is just an introductory text. For more, you can surf my blog and search the net. You can subscribe to my blog and/or grab the RSS Feeds to stay updated with me! :) And don’t forget to comment below for any kind of queries, suggestion, criticism, etc! It’s great to see another post from you. Nicely done, as always. Hope all is well with you. Can’t wait to see more (hopefully something on graphical lid’s). pls suggest me. How to make a robatic machine? Please be specific about the type of the Robotic Machine that you want to go for. There are loads of them, but which one you want to go for ? For your information, there is manual robotics, autonomous robotic, artificial intelligence, image processing and many more. Please make your question more specific. to look it over. I’m definitesly loving the information. I’mbook-marking and will be tweeting this to my followers! Excellent blpg and amazing design. How can i implement a walking robot using legos..
Are you using the Lego NXT Mindstorms kit? In that case things are a lot simpler than you think. Start with making the design and connect all the actuators (motors) to your NXT controller. Then using Mindstorms software, program the actuators to move in sync. Makes sense? But what kind of controller will i use (Pd, Pi or Pid)? I understand will need to use matlab or simulink…In your opinion, what the best and easiest language? Last que… Is there a big difference between the NXT controller and the EVE? Depends. Choosing the type of controller (PD/PI/PID) depends upon how your system responds. First try building the system. Why do you need to use MATLAB? What for? EV3 is an advanced and newer controller built using a faster processor, and gives higher performance. But you can implement anything using both NXT and EV3.